One of the best gifts I ever received was a cookbook with personalized notes in it telling me which recipes were worth trying. If you are anything like me, you’ve pinned approximately 27 million recipes on Pinterest, but how many have you actually tried? Sometimes it is just nice to have a real life person tell which recipes are worth it. I’m challenging you to bring Pinterest to real life and try a new recipe this week! To inspire you, I’m sharing 23 Pinterest discovered recipes that are worth trying out. Each recipe is linked to Pinterest so you can easily pin these winners for later. While you are there, I would love to have you follow me! Smothered Beans & Rice Burritos – This is my favorite burrito recipes. All the yummy-gooey stuff on top makes them oh-so-good! Plus it is a freezer friendly recipe, which I love. Crockpot Cheesy Pasta & Beef Casserole – Grace went on and on and ON about how much she loved this recipe. It makes a lot, so we had it for leftovers a couple of times and she sang my praises every time. Baked Sweet & Sour Chicken with Fried Rice – This recipe is sooooo good, but it is too much effort for a weeknight supper. Save it for the weekend or anytime you don’t have children crying at your feet. I’ve only made this once because of the effort, but I’ve literally day dreamed about making it again. I think I used my own chicken fried rice recipe. Zucchini & Ground Beef Skillet Casserole – This is one way that I use zucchini from my garden in the summer. The flavor is really good and all the ingredients are unprocessed. Crockpot Italian Chicken – The first time I made this recipe, it was a bit too salty for me. I cut back on the Italian dressing and that helped a lot. My whole family really likes this recipe, but it does call for some processed ingredients (cream of chicken soup) that some people like to avoid. Pizza Balls – This recipe is easy and fun. It would be good for lunch, but I never like to turn my oven on for lunch. Cheesy Chicken & Wild Rice Casserole – This is another recipe that takes some extra effort. There are two different kinds of rice that you need to have prepared. Plus you need cooked chicken. After I made it once, I didn’t think I would ever make it again, but it was so good that I had to. Double Decker Tacos – Crunchy and soft tacos all in one! This is a fun way to make taco night extra special. Sausage, Lentil, & Rice Skillet Meal – I can get the sausage at my discount grocery store, which makes the meal really cheap. It is on my regular rotation of cheap meals. Crockpot Creamy Mexican Chicken & Black Beans – Stop reading right now and pin this recipe. RIGHT NOW! This recipe is a foolproof meal to make when company is coming over. I’ve made it several times and I’m always asked for the recipe. I serve it over spanish rice to add some extra flavor. Taco Casserole – I don’t think this is the healthiest recipe with the chips, sour cream, cheese, and lack of vegetables, but it is oh so good! It freezes really well. I always make two and put one in the freezer for later. I add rice and black beans to help stretch the ground beef. Spaghizza – Spaghetti and pizza combined to make this wonderful dish. It is also freezer friendly. 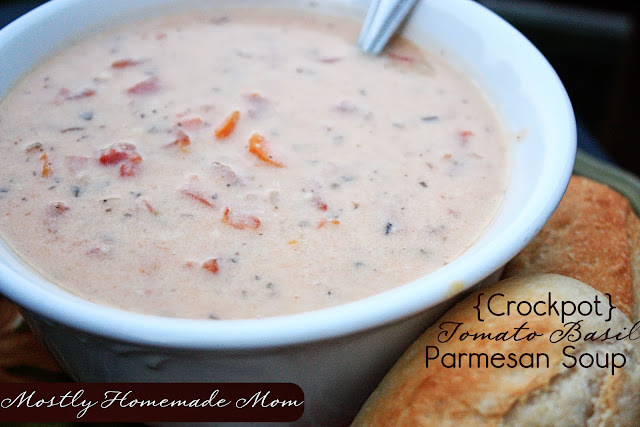 Crockpot Tomato Basil Parmesan Soup – This is a creamy twist to regular tomato soup. It is a nice soup for company or if you are taking a meal to someone. Olive Garden’s Zuppa Toscana Soup – Nothing from the Olive Garden is bad. NOTHING! This soup can get a bit spicy from the crushed pepper flakes, so adjust that accordingly if you are sensitive to hot stuff. This is also a freezer friendly recipe. Slow Cooker Creamy Chicken & Wild Rice Soup – This might be my favorite Pinterest recipe find of all time. L-O-V-E this soup!!! I have made this several times for company. Serve it with a salad and a good bread. 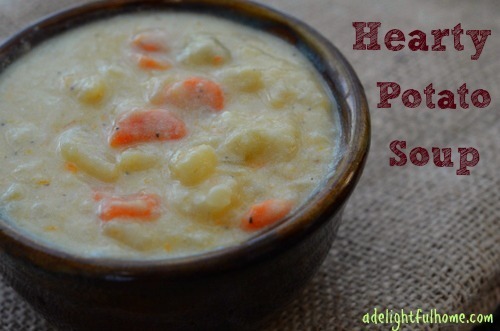 Hearty Potato Soup – This is a really good recipe with no processed ingredients. I don’t add the green chilies because my kids don’t like spicy things. However, Nate and I add some straight to our own bowls and I love the extra flavor it adds. Panera’s Broccoli & Cheese Soup – I don’t think this is the healthiest soup and I don’t care. It is amazing. Chocolate Whole Wheat Zucchini Muffins – Oh goodness… This is like eating cake, but it is whole wheat and has zucchini in it, so it must be healthy! Or maybe not. I make it with coconut oil and I love the extra hint of coconut flavor. Pumpkin Pie Dip – This dip is great for someone who is watching what they eat. The amount of calories per serving is really low and the serving size is a good amount. Don’t let all that healthy talk fool you though. It is GOOD even though it is healthy! Chocolate Peanut Butter Banana Smoothie – This a healthier version of a chocolate milkshake and I can’t get enough of it. I add a lot of ice cubes (in the blender) until it is as thick as I want it. Otherwise, it is a really runny smoothie. Easy No-Bake Granola Bars – I double this recipe to make a 9×13 pan. I left out the chia seeds because I didn’t have any and the recipe still turned out great. They are so much better (and better for you) than store bought granola bars. Cream Cheese Squares – These are very simple to make. They would be great for brunch. Homemade Coffee Creamers – This isn’t the healthiest thing to put in your coffee, but it is so much better than fake coffee creamer you can buy at the store. The store bought stuff usually doesn’t even have dairy in it! I like making the almond version. I hope you’ve been inspired to try a new recipe! Let me know which recipes are on the top of your list to try. Photos used with permission from Amy’s Finer Things, Live Renewed, Hey Donna, Mostly Homemade Mom, and A Delightful Home. These are some of our favorites. I have made them all at least once, if not quite a few times!! Thanks for the recipe suggestions! I will check them out!